This post is a detailed review of benchmarks. If that's useful, read on. A valid benchmark has 7 components that go by the mnemonic SAMURAI. These are often tested in a multiple choice question. Furthermore, and this is really important, all benchmark questions should be compared against the tenants of the SAMURAI properties. Because as long as you are SAMURAI, you’re good. A few notes on manager universe benchmarks (because it has its own LOS). It fails all benchmark criteria except for being measurable. 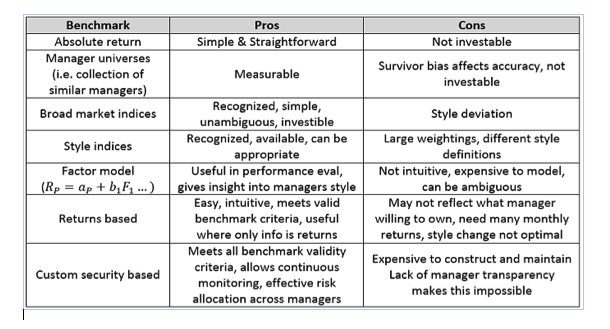 It is not investable (cannot ID the median portfolio in advance), It is ambiguous, You cannot verify appropriateness (because again, it is ambiguous), Have to rely on compiler representation of data, Survivor bias is present (underperforming managers fall off, biased upwards).